If you’re looking for more information on McCain as a global business, head over to McCAIN.COM. In 1957, the McCain brothers founded our company in their hometown of Florenceville, Canada. McCain created the first ever frozen chip and went on to become the world’s largest manufacturer of frozen potato products. Today McCain is still family owned, and has grown to 52 production facilities across six continents, employing over 21,000 employees across the world. That’s a lot of potato experts. We started our business in Yorkshire and we’re still there today. We have four McCain factories across the UK, including our head office in Scarborough, North Yorkshire. As well as a strong network of farmers, we also own a potato seed business in Montrose, Scotland. McCain is the UK’s largest purchaser of British potatoes, buying approximately 15% of the annual potato crop. 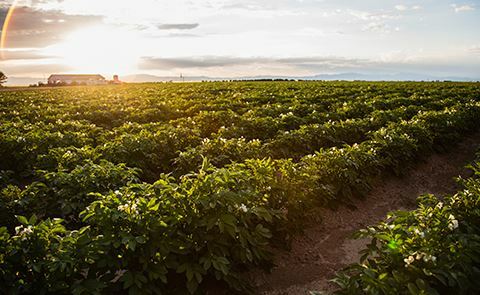 We work closely with over 250 UK growers to make sure the best potatoes are harvested. We want everyone to enjoy potatoes as part of a healthy, balanced diet. Potatoes are virtually fat free, an energy rich carbohydrate, as well as being full of fibre, vitamin C, potassium and iron. How do we make chips? Like our potatoes, we keep it simple. We simply wash, peel and cut our spuds, then lightly fry in sunflower oil. Then we freeze them. And that’s it. Some of our products do have natural coatings or flavourings. 95% of our potato products have only green or amber nutritional indicators, meaning they’re low in saturated fat, fat and sugar. Most of our products are low in salt and we’re continually looking to reduce this where possible. We were the first food manufacturer to have front-of-pack, colour coded nutritional labelling on our products. Full nutritional information and reference intake guidance can be found on the back of our packs, and our PRODUCT PAGES also provide specific products’ nutritional values. Freezing also has many benefits and acts as a natural preservative. You can also cook and serve the portion size you need, so there’s less food waste. Frozen food is also convenient to cook, requiring very little preparation. Our expertise goes into every stage of making our products – right up until they’re served on your plate. That’s how we make the delicious food that so many people love and enjoy today. At our potato business in Montrose, Scotland, we grow seed potatoes. To get the best quality and taste, we use 12 different varieties from over 50 specialist seed growers in the North and East of Scotland. As the UK’s largest purchaser of British potatoes, McCain buys approximately 15% of the annual potato crop. We’ve also built close links with over 250 potato growers across the UK, so we can ensure quality even further back in the chain. Since day one, we’ve always used the best potatoes, sourced from our trusted partners. We have a thorough quality control process – from checking our potatoes, all the way through to the final taste test. We have traceability right back to each supplier – like our potatoes, which come with their own ‘passport’. This way, we can see the exact field where our potatoes came from. It’s this attention to detail that’s helped us make the nation’s favourite chip. 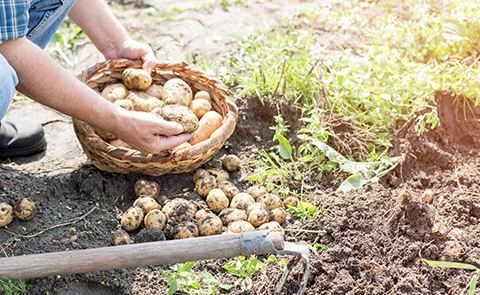 Our potatoes wouldn’t be what they are without our farmers. 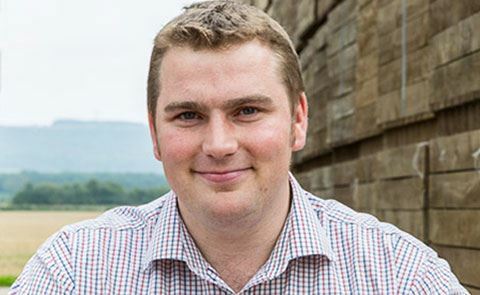 They’re a natural extension of our business, with some partnerships going back three farming generations. 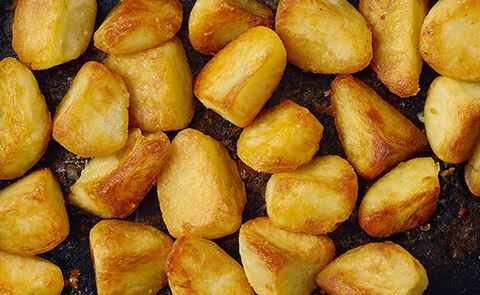 We’re committed to using British potatoes. McCain is a leading supporter of the Red Tractor Assurance Scheme and all of our UK growers are members. Look out for our 100% British logo and Red Tractor logo on our packs. From the Highlands right down to Cornwall, our trusted relationships with over 250 UK growers are a key to our business. Filey-based farm, H. Sutton & Son, have been growing potatoes for McCain for over 20 years. Henry Sutton heads up his family business, while son-in-law Dave Pick and daughter Liz have taken the reins of running the farm – which includes growing more than 6,000 tonnes of potatoes for McCain every year. To help our growers run effective, sustainable farms, we also provide research and tools to enhance harvest efficiency, reduce waste and take care of the environments they work in. We encourage our growers to use the most effective water irrigation system and protect their resources. We are a responsible food manufacturer with strong links in farming. Whatever we do, we aim to do it with minimal impact. As well as encouraging our growers to maximise their natural resources, we’ve invested millions of pounds in renewable energy at our factories. 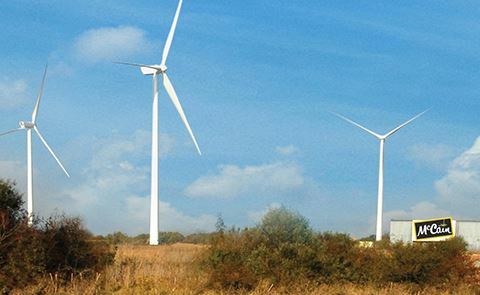 Our Whittlesey factory can generate 70% of its own electrical energy via wind turbines and an anaerobic lagoon. The site also boasts a reverse osmosis, self-contained water treatment plant, which has seen our water usage reduce by 25%. We’ve reduced our carbon footprint by using longer lorries. This enables us to carry more products to our customers. So far, we’ve saved a minimum of 770,000 road miles since 2013. Currently over 99% of all McCain food waste is recycled into animal feed, by-products or renewable energy. Through our partnership with food redistribution charity, FareShare, we also donate surplus products, which helps local communities, as well as helping us to control our food waste. Since our partnership began in 2013, we have donated the over 118,0000 meals. We’re pleased to announce that McCain Foods (GB) Ltd. has made a Packaging Pledge to ensure all of our plastic packaging is recyclable by 2020. For more information please click here. At McCain, we know that good people are the key ingredient to a successful business. In the UK we have over 1,600 employees who help us to produce some of the nation’s favourite potato products. Being a McCain employee has a number of benefits. These include a generous pension scheme, a range of learning and development opportunities, healthcare support, a company Cycle to Work Scheme and access to McCain Community Stars – a grant scheme to support our employees’ voluntary work. Employees are also awarded for outstanding contributions to the business at our annual awards ceremony. As a global business, we also offer employees overseas opportunities, meaning many of our people have been able to add international experience to their CV. If you’re interested in joining our team, current job opportunities at McCain are listed on our CAREERS PAGE. As a responsible, family-owned company, we’re proud of the many charities and community organisations we’ve supported over the years. We work in partnership with a number of organisations in areas that we think will make the biggest difference to the communities where we live and work. These partnerships cover three areas: educating the next generation, encouraging healthy, active lifestyles, and reducing food waste. McCain Engineering Apprenticeship Scheme: This scheme forms part of an industry-wide approach to help develop future engineers and inspire young people to join the food manufacturing sector. McCain Scholarship Programme: It’s not just our employees’ learning we support – it’s their children’s too. Every year we award up to seven scholarships for higher education to the children of people who work for us. Outside of our business, we support education in many ways to help create new opportunities for young people in the food and drink industry. Our activities include supporting the broader industry in establishing the first UK MEng Food Engineering degree at Sheffield Hallam University and backing the development of a University Technical College in Scarborough, the town of our head office. We’re committed to making food that can be enjoyed as part of a healthy, balanced diet. As part of our commitment, we also want to encourage our consumers and communities to enjoy an active lifestyle and understand more about their food. We support various initiatives, from encouraging school children to grow their own potato crops through AHDB Potatoes’ Grow Your Own Potatoes Scheme, to helping to organise the annual McCain Yorkshire Coast 10k and family run. Sixty years ago, the McCain brothers established our business on their belief that ‘Good ethics, is good business’, and this remains fundamental to our values today as a responsible company. As such, McCain Foods (GB) Limited is committed to ensuring that slavery and human trafficking are not taking place in any part of our business or supply chains. We know that our business is enhanced when our workforce represents the diversity of our customers, consumers, suppliers and communities. McCain is championing diversity and real people in our advertising and has many initiatives as a business. As part of this we welcome the introduction of ‘Gender Pay’ reporting and acknowledge the need for progress in bridging the gap that exists today. Our reports can be found here: 2017 Report / 2018 Report. McCain is committed to full compliance with all relevant U.K. tax laws, rules, regulations and disclosure requirements. McCain seeks to uphold its high standards of business conduct and ethics as reflected in McCain’s Code of Conduct. More information can be found here.